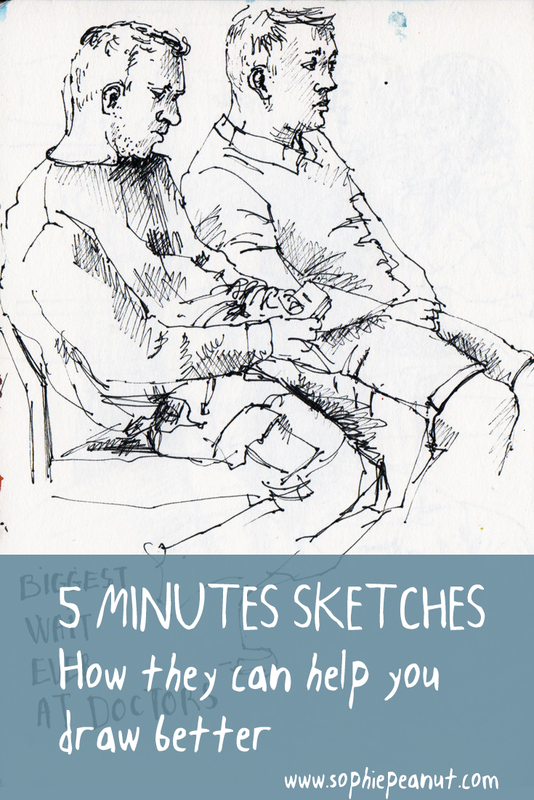 Only 5 minutes to sketch? Make the best of it as these quick messy sketches will help improve your drawing and painting skills. People move, it starts raining, someone stops for a chat. You settle for a sketch and things don’t go to plan. Twenty minutes sketches turns into a 5 minutes sketches. The doctor will call you for your appointment shortly, or your train will be there any time. There’s no time to crack your sketchbook open. Thirty minutes later you’re still waiting. You dream of the sketch you’d done if you’d got stuck in! A few sketches on the same spread. Guests at a wedding on the top left. Quick value study of the view from our caravan while camping (see unfinished chap in glasses in the mountains). 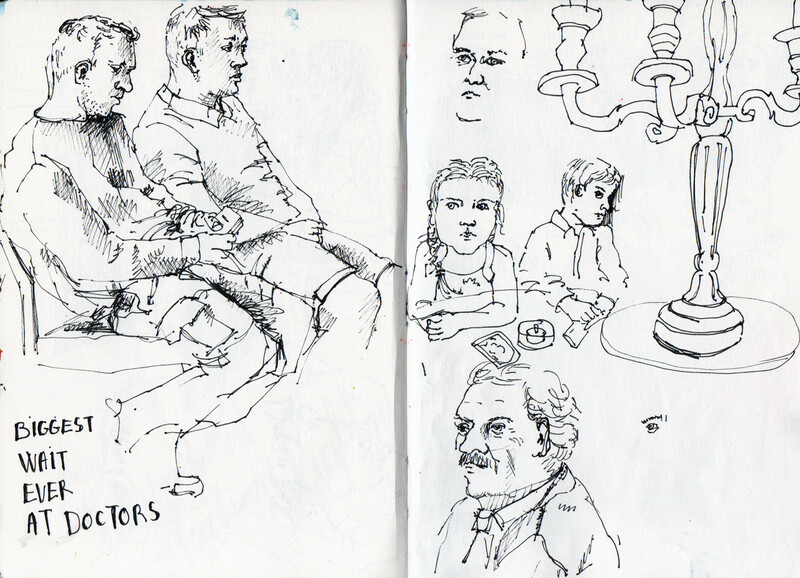 5 minutes family sketch – everyone is moving faster than my pen! It is nice to have a sketchbook full of lovely finished spreads, but sketchbooks are also great to play, experiment and get messy. Quick 5 minute sketches might not impress people as much (although you’ll find that often they do), but they are great to hone your drawing skills. You learn drawing or painting through practice. All those quick drawings will add up. You’ll find you are faster and more confident when you start a ‘proper’ drawing. Think of 5 minutes drawings as quick notes – gather them on a spread of your sketch book building the composition as you go along. You’ll be surprised how sometimes your quick sketch might turn into a much longer one. 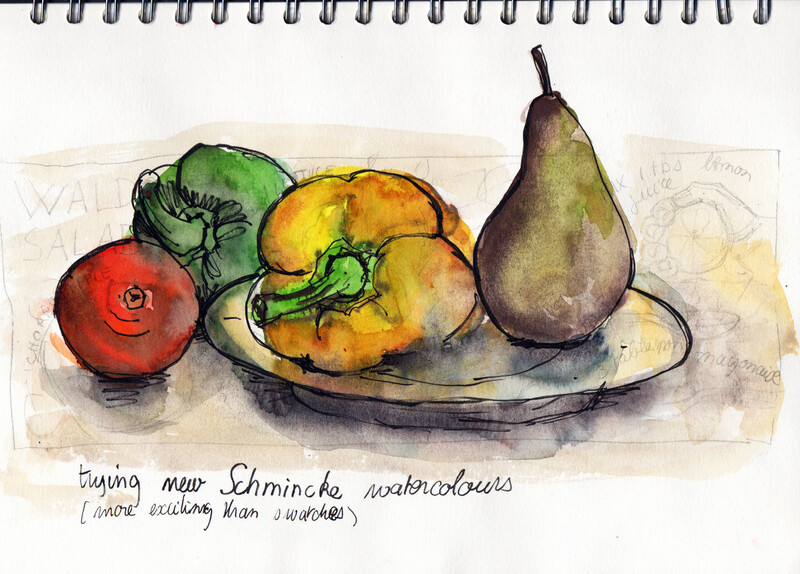 There will be no pondering over missed sketching opportunities either! Not all drawings will be finished. Accept it. 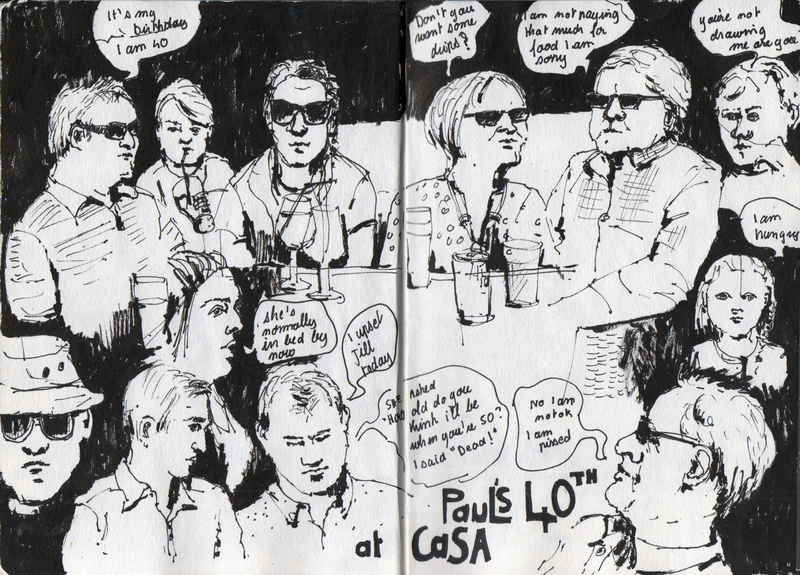 My sketchbooks are full of half drawn people. They just moved before I finished. It can’t be helped! Quick sketches in the doctor’s waiting room. 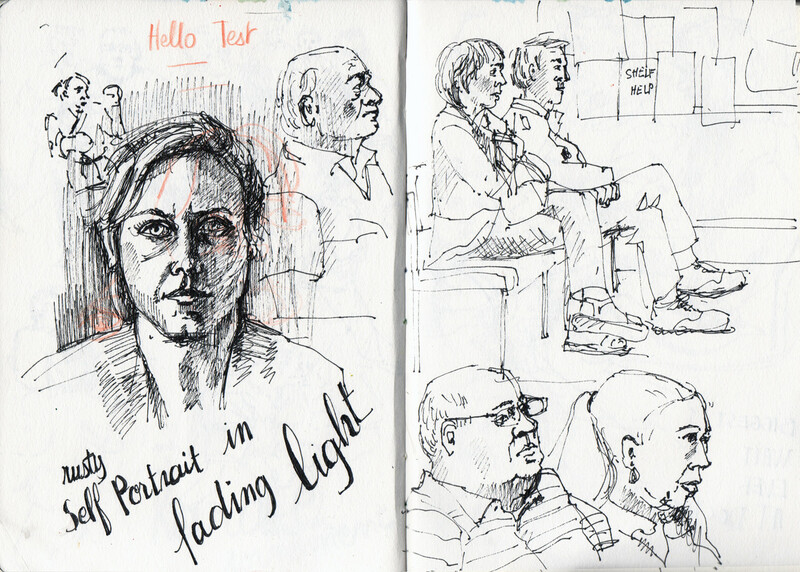 Some people look a bit odd as I finished the sketch from memory after they moved. You can see bits of drawings underneath the self portrait, including an action sketch at a karate tournament! A long wait at the doctor’s turned a quick sketch into a detailed study. An attempt to sketch people at a wedding every one is moving, so I end up drawing the chandelier… off the page as I mis-judged the proportions. 5 minute sketch at home. Testing out a new watercolour set. You can see a pencil sketch for a recipe layout underneath. 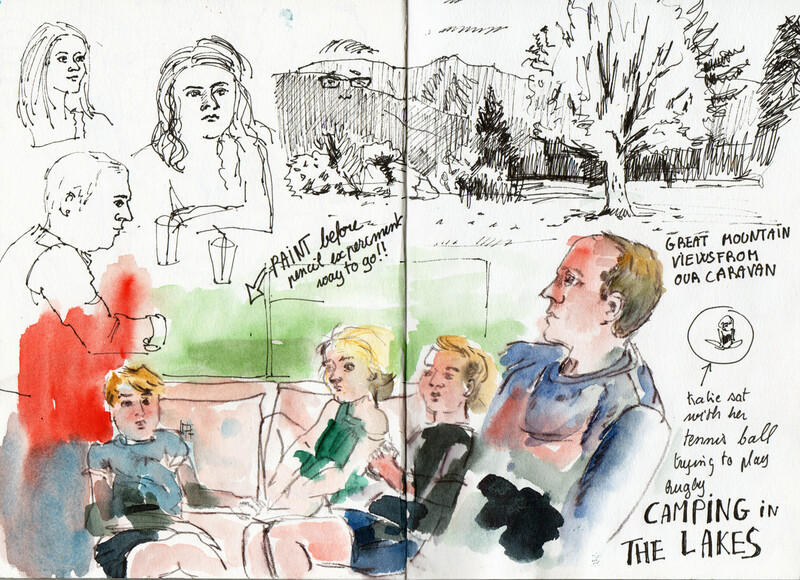 Drawing the family at home. 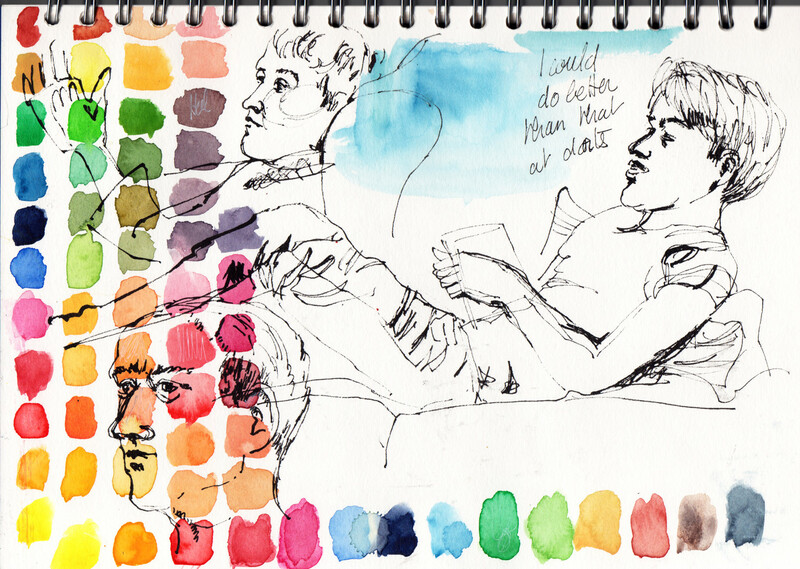 I like the effect of the colour swatches on this messy sketchbook page. Love this post! I get so hung up on even making my sketches perfect, and I want to be able to embrace fast sketching more! Thank you for sharing! Thanks. I am glad you’ve found my post useful.